Menstruation is normal, even for men. And, if you don't think so, just ask Toni. The first time I got my period I was 13 years old. I was in English class when a strong menstrual cramp hit me in my abdomen. I felt a strange warmth in the seat of my pants, and I just knew — I got my period. I raised my hand for a restroom pass. Once I was there, I checked myself. Sure enough, there was the first evidence of my journey into womanhood, and I had nothing to wear. Because someone gave me a copy of the book, Are You There God? It's Me, Margaret by Judy Blume and I'd read it cover to cover, I knew what to do when menstruating. I had already played out in my mind what I'd do the first time I got my period if I were caught in this kind of situation. Like Margaret, I rolled up a little bit of toilet paper and used it in place of a pad. I went back to class and held on tight until I got home. When I did get home, my mom was at work. Unfortunately, she didn't use pads. I only found a box of tampons. I had no idea how to use one. Trust me when I say, it was painful to try and figure it out. It would have been helpful if an adult talked to me about the wonderful world of menstrual cycles, unpredictable periods, PMS, and period cramps. No one had ever told me about pads or and other feminine hygiene products. I was thankful for authors like Judy Blume who had the courage to write a book that helped cisgenders like me know what to do. You'd think with all the commercials and health classes in the world, kids would feel more confident about how to handle their own first-period story. But today, there are new challenges and questions to answer including how this biological phenomenon affects LGBTQ persons, and those who don't understand the LGBTQ community. There's still so much more to learn about the wonderful world of menstruation and period cycles. And there's a new author who is trying to help explain what it all means — with a little help from Toni The Tampon, of course. Here are 5 facts about her crafty little cartoon character, Toni The Tampon, and why she hopes to use her work to educate and improve the lives of future menstruators — cisgenders and transgenders, everywhere. 1. Who created the character "Toni The Tampon?" Toni The Tampon is a cartoon character created by Cass Clemmer, a children's author and illustrator. Clemmer is also a reproductive health educator. Cass Clemmer grew up in a conservative, Southern Baptist family. Her passion for reproductive health and education is rooted in her desire to alleviate the "shame stigma" associated with menstruation that she experienced growing up. 2. Who is Toni The Tampon? Toni The Tampon is, in fact, an actual tampon. Toni can be colored and learned from in its book, The Adventures of Toni the Tampon: A Period Coloring Book. 3. Why did Cass Clemmer want to make a cartoon character that's a tampon? Originally, the character was created to promote awareness of menstruation, but then it developed into more, much, much, more. Toni now promotes LGBTQ awareness and a proclaims periods as a multi-gender issue with a message of inclusion. According to the Toni The Tampon Instagram page, "The answer is quite simple: people with menstruating uteruses may identify on any number of points along the multidimensional gender spectrum. There are agender menstruators, genderqueer menstruators (like me! ), other non-binary menstruators, and yes, trans menstruators who are men or boys. We simply seek to be inclusive of all menstruators, no matter how you identify." 4. What gender is Toni the Tampon? Toni The Tampon does not have a gender. Toni is just Toni. As a gender inclusive project, Toni represents any and all persons, both male, and female, who have periods. 5. 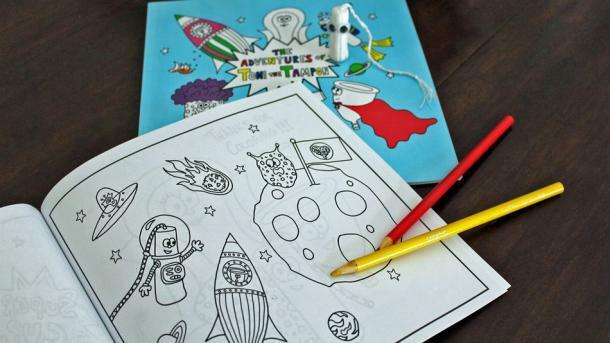 How can parents use Toni the Tampon coloring book to teach their children about periods? Parents are encouraged to use the coloring book and Toni The Tampon's adventures as a conversation starter. As parents color with their child and learn about Toni's adventures, parents can answer tough questions like, "Can men have periods?" for their child.